Acne is one of the most common skin conditions affecting millions of people across the world. You can buy over-the-counter acne products and spend hundreds of dollars to find out if a particular product works for you. A more cost effective option to try first is to use lemon juice for your acne. The juice of the common lemon has several properties that can help cure your acne and may help lighten the scars that can be a result of severe acne. How Does Lemon Juice Help Acne? The main active ingredient in lemon juice is L-ascorbic acid. This nutrient is a potent antioxidant that can promote healing while cleansing the skin. The acidity of lemon juice makes it a powerful disinfectant that destroys the acne bacteria that contribute to flare-ups of acne. The P. acnes bacterium occurs naturally on the skin and can keep other bacteria at bay. However, P. acnes can also cause acne when it is trapped in blocked pores. As skin cells die, these cells and increased oil production can block pores leading to an increased chance of developing acne. Again, because lemon juice is highly acidic, it will act as a natural exfoliant helping the skin to get rid of the dead skin cells. As these skin cells are removed, the result may be similar to a dermabrasion treatment at the dermatologist's office. Used regularly, lemon juice may help to exfoliate your skin, leaving it softer and acne scarring less noticeable. Lemon juice has been used for years to lighten hair and skin. When the acute acne sores disappear, acne scars and increased skin pigmentation may result. The acne spots will usually disappear over time but you can help speed that process by applying lemon juice directly to the red or dark spots. How Should I Use Lemon Juice for Acne? Using lemon juice for acne is a simple process. Be sure to start with a clean face. Before applying anything to your face, you should wash with soap and warm water. You may also want to leave a warm towel on your face for a few minutes after washing to allow the heat to open the pores on your face. 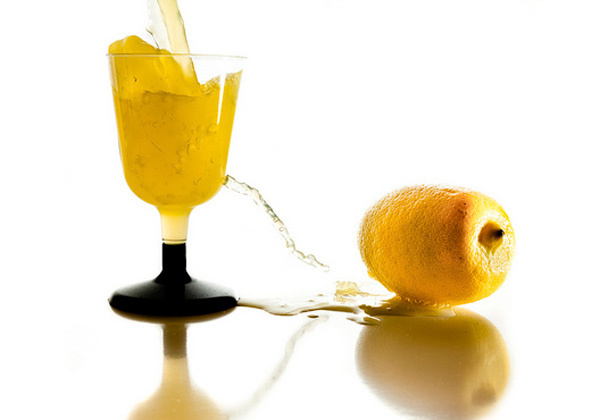 Squeeze the juice from one or two lemons until you have 1-2 teaspoons of lemon juice in a small bowl. Using a cotton ball or cotton tipped applicator, apply some of the lemon juice to each pimple or reddened area. After the lemon juice has been in place, rinse your face with cool water. Using cool water will help close the pores to prevent further clogging. Note: If you do the treatment at night, let the lemon juice dry and stay on your acne overnight. If you do the treatment during the day, leave the juice on the sores for at least 30 minutes -- the longer the better! Experiment with the frequency of treatment. Some people find that application every day is too drying for their skin. In this case, it is fine to do the treatment every two or three days instead of daily. You should be aware that applying lemon juice to open acne sores could result in stinging because of the acidity of the lemon. While this stinging can be uncomfortable, you can use lemon juice diluted with water to decrease this effect. Who Should Not Use Lemon Juice for Acne? As beneficial as lemon juice can be in treatment for acne, there are people who should not use this treatment. First, as with any other treatment, lemon juice may simply not work for everyone. If you try this treatment and it does not work, consult your dermatologist who can recommend a more traditional acne treatment. In addition, anyone with naturally dark skin should not use lemon juice for acne. Melanin, the substance that causes skin to be darker, is produced in cells called melanocytes. Lemon juice causes these cells to produce more melanin that may actually lead to darker skin and darker spots where acne once existed. When exposed to sun, this darkness may be even more pronounced. It is recommended that dark-skinned people NOT use lemon juice for acne unless recommended by a healthcare provider.